Matching items including "Save the Date" cards, Invitations (main ceremony & evening), Orders of Service/Ceremony, Place Cards, Table Plans and "Thank You" cards. Variety of designs including watercolour paintings and various "papercrafts". Got a question? Message PeaBee's. A sample for proof reading will be sent within 14 days (unless otherwise advised), with the cost of the sample to be deducted from any subsequent order. As the items are made to order please allow 28 days for full orders to be sent. Returns will only be accepted if there is an error in printing, which was NOT on the sample item. The onus is on the purchaser to ensure that the sample is correct. Standard Cards - £1.00 each "Mini-gift" cards - from £2.00 each (" mini-gifts" include earrings, brooches, key rings, fridge magnets & phone charms). Post & packing (Royal Mail 2nd Class..
At Â£2.50 each these unique cards are real bargains. The cross-stitch element is removable and has a hanging loop for use on a Christmas tree. The cards are approximately 4" x 6"..
At Â£2.00 each these unique cards are real bargains. The cross-stitch element is removable and has a hanging loop for use on a Christmas tree. The cards are approximately 4" x 4"..
At Â£1.00 each these cards are real bargains as all the photographs used have been taken by me and are copyrighted to me. 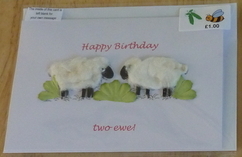 The cards are approximately 4" x 4" with an appropriate..
Cards FROM Â£1.00 each. Please contact me if you have a specific design in mind for your particular child - I would love to make a card for a fairy-loving 5 year old of a space-obsessed 7..